Heatmapping is a helpful tool for publishers/developers; an area of high concentration of deaths indicates that particular section of the game may be too difficult. Developers can then opt to incorporate this knowledge into the next generation of the game, or patch the current generation. Left 4 Dead does this all the time, with occasional environmental updates in areas were Valve knows players are having too much trouble. Demon Souls does this in real time by recording player deaths, and replaying them for others as a warning. 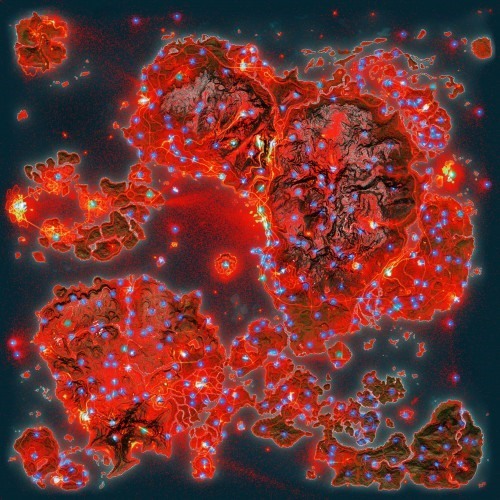 Blackhurst's heat map of more than 22.3 million player "Extraction" events. A player death can also be a positive; a concentrated number of deaths can indicate where players are having fun and experimenting. Like the stunt video above, many players love to die a gnarly death for the pure fun of it. It will be interesting to see how developers incorporate heatmapping in the future, employing statistics and analytics to enhance gameplay. To read more about Blackhurst's mapping process, visit his site. A brief look at the JC2 point cloud visualisation running on Blackhurst's desktop PC.